​Relaxation techniques given to us by nature. Such as sounds of water, beauty of the birds, smell of pine, pictures in the clouds, and many other experiences. KAKABIKA FALLS: The Cisco Branch of the Ontonagon has the Kakabika Waterfalls. That is just west of the cabin on Road 527. Turn right, driving west off the main highway. It is a beautiful waterfall with S curves, mosses, variety of trees, etc. UNIQUE RECREATIONAL AREA: The back country setting, the gorge-like landscape, exposed sandstone cliffs and waterfalls provide a unique recreational area for the Midwest. 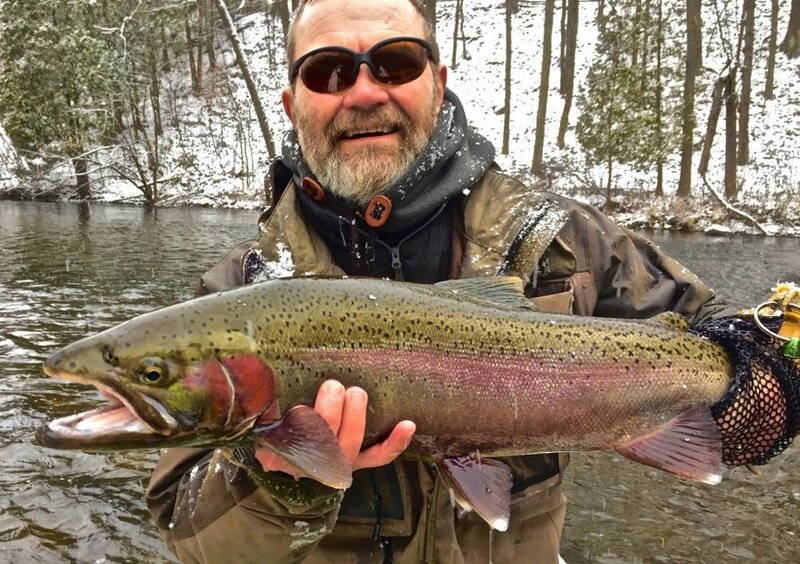 The river also has excellent fishing for trout, Lake Superior run salmon and steelhead. The river's outstandingly remarkable values include scenery, recreation, geology, fish and wildlife. TWO MILE CREEK: Come explore and use the cabin as your base for adventures. Two Mile Creek, which supports native brook trout, and drains into the Cisco Branch of the Ontonagon River. ​BEATONS LAKE: Beatons Lake is just north of the cabin (circle driveway of the cabin goes out on Beatons Lake Road). Variety of types of trout, etc. Approximately a 330 acre lake. The 330-acre lake is located about 12 miles northwest of Watersmeet. It reaches a maximum depth of 90 feet with sparse aquatic vegetation, though there is an almost continuous gravel shoal area around the lake that should provide adequate spawning habitat for smallmouth bass. The lake has no inlet and forms the headwaters of Two Mile Creek, which supports native brook trout, and drains into the Cisco Branch of the Ontonagon River. This lake has beautiful night skies for watching northern lights and meteor showers. People who have never experienced night-fishing with lanterns for trout will find this a great place to do so. See mapbook or maps for correct roads to boat landing. PRESQUE ISLE RIVER: To the West and Southwest of the cabin approximately is the Presque Isle River. The cabin is between Watersmeet and Marenisco, MI. The Presque Isle River is West of the cabin toward Marenisco. Some people enjoy kayaking and canoeing on this river also. The river comes from the Wisconsin Michigan border. The cabin is just over the Wisconsin border on the Michigan side. Fishing is done on a variety of areas of the river. OTHER AREAS: Listed on following pages. Take a day trip and see the scenery north or northwest of the cabin. Porcupine Mountains, Lake Superior (trout and salmon fishing), and more. Make it a week and do all sorts of the areas for trout fishing and just relax. Or, take some time away from fishing and enjoy the waterfalls. Or, enjoy some restaurants, historic sites, ATV ORV trails, scenic sites and more. ​Reasonable rates. On trail system. Lakes, rivers, scenic areas, waterfalls, more. The beautiful browns originally came from Germany but they sure have thrived in the U.P. ​Some great U.P. trout waters. 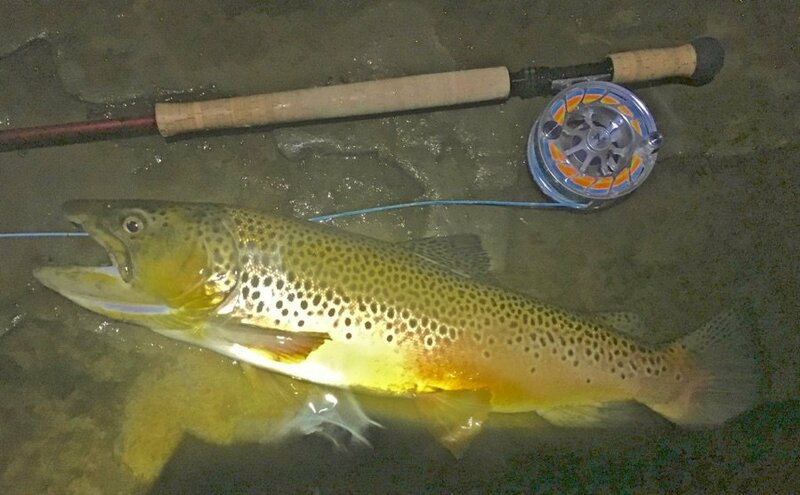 Key areas for trout fishing or fishing in general is the Watersmeet, MI and Marenisco, MI areas. This cabin is right between these areas in Stickley, MI. 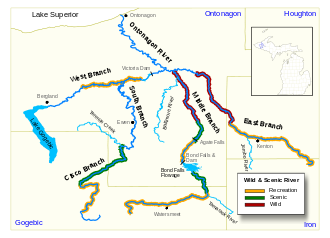 That means enjoy Presque Isle River, Two Mile Creek, Beatons Lake, Ontonagon River, Slate River, Cisco Chain, Lake Gogebic, and many more areas listed on other pages of this website. Come take splendor to the area. stickleylodgegetaway.weebly.com for old time pictures, information, much historic value). Stickley is right between Watersmeet and Marenisco and in every direction there is trout fishing. ​Many individuals before you loved the creeks, rivers and lakes. Come find some hidden fishing areas. Use the cabin for your base camp. Enjoy Michigan and Wisconsin. There are many lakes, rivers to go trout fishing around the vicinity of the cabin. The cabin would be a great base camp to do your fishing adventures for trout (or other fishing). Go South, Southwest, North, Northwest, East, West, etc. of the cabin and find your fishing loations. Some of the lakes that are south or southwest approximately of the cabin are: Summit Lake, Elbow Lake, Redboat Lake, Henry Lake, Thrush Lake, Ormes Lake, Range Lake, Dawn Lake, Mishke Lake, Plymouth Lake, Little Oxbow Lake, Mastodon Lake, Bluebell Lake, and others. Some of the lakes are mapped out with boat landings and others with canoe access, etc. Verify current information on new maps, or verify with Forestry Service in Watersmeet, DNR, etc. on current information, curent fishing, etc. ​Then there are other lakes such as: Beatons Lake, Lake Gogebic (other types fishing) Cisco Chain, Two Mile Creek, Presque Isle River, Moon Lake, Imp Lake, Kildeer Lake, Castle Lake, Little Duck Lake, Skyline Lake and another part of the Ontonagon River, the Middle Branch, trout fishing is split into an upper and lower section. The upper section is between the Gogebic County line and the town of Watersmeet. Brookies predominate but there are good numbers of browns and rainbows. The lower section flows from Bond Falls down to M-28. Here, brookies will be the main catch. The area has MANY MANY creeks, streams, rivers. Maps of the area show such a variety. Such as: Pelton River, Slate River, Presque Isle River and more. The cabin is within water paradise. Many areas are just west of the cabin; in the vicinity of water wonderland.